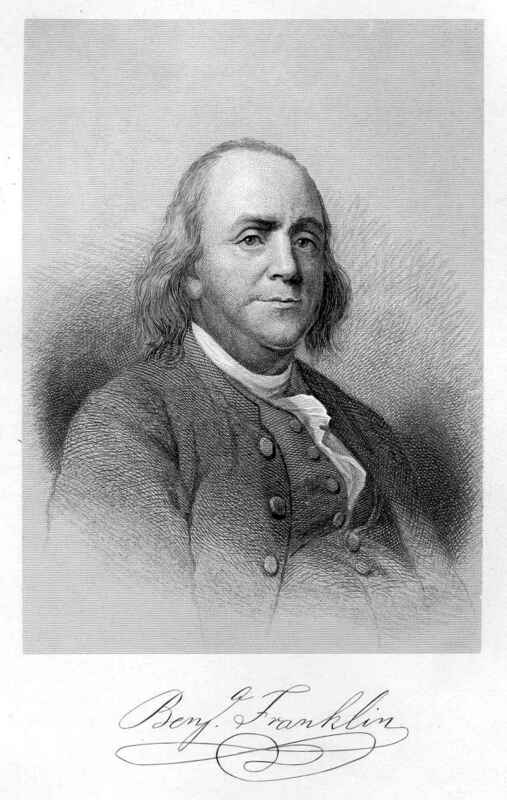 FRANKLIN, Benjamin, statesman and philosopher, born in Boston, Massachusetts, 17 January 1706;(1. in Philadelphia, Pennsylvania, 17 April 1790. (See representation of birthplace on page 531.) His family had lived for at least three centuries in the 15arish of Ecton, Northamptonshire, England, on a freehold of about thirty acres. For several generations the head of the family seems to have been the village blacksmith, the eldest son being always bred to that business. Benjamin's grandfather, Thomas, born in 1598, removed late in life to Banbury, in Oxfordshire, while his eldest son, Thomas, remained on the estate at Ecton. This Thomas received a good education, and became a scrivener. He came to be one of the most prominent men in his County, and formed a friendship with the Earl of Halifax. In mental characteristics he is said to have borne a strong likeness to his immortal nephew. The second son, John Franklin, was a dyer of woolens, and lived in Banbury. The third son, Benjamin, for some time a silk dyer in London, immigrated to Boston at an advanced age, and left descendants there. He took a great interest in politics, was fond of writing verses, and invented a system of shorthand. The fourth son, Josiah, born in 1655, served an apprenticeship with his brother John, at Banbury, but removed to New England in 1682. From the beginning of the Reformation the family had been zealous Protestants, and in Mary's reign had incurred considerable danger on that account. Their inclination seems to have been toward Puritanism, but they remained in the Church of England until late in the reign of Charles II, when so many clergymen were dispossessed of their holdings for nonconformity, and proceeded to carry on religious services in conventiclers forbidden by law. Among these dispossessed clergymen in Northamptonshire were friends of Benjamin and Josiah, who became their warm adherents and attended their conventiclers. The persecution of these nonconformists led to a small Puritan migration to New England, in which Josiah took part,. He settled in Boston, where he followed the business of soap boiler and tallow chandler. He was twice married, the second time to the daughter of Peter Folger, one of the earliest settlers of New England, a man of some learning, a writer of political verses, and a zealous opponent of the persecution of the Quakers. By his first wife Josiah Franklin had seven children; by his second, ten, of whom the illustrious Benjamin was the youngest son. For five generations his direct ancestors had been youngest sons of youngest sons. As a child he showed such precocity that his father at first thought of sending him to Harvard and educating him for the ministry; but the wants of his large family were so numerous that presently he felt that he could not afford the expense of this. At the age of ten, after little more than a year at the grammar school, Benjamin was set to work in his father's shop, cutting wicks and filling moulds for candles. This was so irksome to him that he began to show symptoms of a desire to run away and go to sea. To turn his mind from this, his father at length decided to make him a printer. He was an insatiable reader, and the few shillings that found their way into his hands were all laid out in books. His elder brother, James, had learned the printer's trade, and in 1717 returned from England with a press, and established himself in business in Boston. In the following year Benjamin was apprenticed to his elder brother, and, becoming interested and proficient in the work, soon made himself very useful. He indulged his taste for reading, which often kept him up late into the night. Like so many other youthful readers, he counted Defoe and Bunyan among his favorites, but presently we find him studying Locke's "Essay on the Human Understanding," and the Port Royal logic. While practicing himself in arithmetic and the elements of geometry, he was also striving to acquire a prose style like that of Addison. He wrote little ballads and songs of the chapbook sort, and hawked them about the Streets, sometimes with profit to his pocket. At the same time reading Shaftesbury and Collins, until some worthy people began to look askance at him and call him an infidel strengthened an inborn tendency toward freethinking. In 1721 James Franklin began printing and publishing the "New England Conrant," the third newspaper that appeared in Boston, and the fourth in America. For this paper Benjamin wrote anonymous articles, and contrived to smuggle them into its columns without his brother's knowledge of their authorship; some of them attracted attention, and were attributed to various men of eminence in the colony. The newspaper was quite independent in its tone, and for a political article that gave offence to the colonial legislature James Franklin was put into jail for a month, while Benjamin was duly admonished and threatened. Finding himself somewhat unpopular in Boston, and being harshly treated by his brother, whose violent temper he confesses to have sometimes provoked by his sauciness, Benjamin at length made up his mind to run away from home and seek his fortune. He raised a little money by selling some of his books, and in October 1723, set sail in a sloop for New York. Unable to find employment there as a printer, he set out for Philadelphia, crossing to Amboy in a small vessel, which was driven upon the coast of Long Island in a heavy gale. Narrowly escaping shipwreck, he at length reached Amboy in the crazy little craft, after thirty hours without food or drink, except a drop from a flask of what he called "filthy rum." From Amboy he made his way on foot across New Jersey to Burlington, whence he was taken in a rowboat to Philadelphia, landing there on a Sunday morning, cold, bedraggled, and friendless, with one Dutch dollar in his pocket. But he soon found employment in a printing office, earned a little money, made a few friends, and took comfortable lodgings (click here) in the house of a Mr. Read, with whose daughter Deborah he proceeded to fall in love. It was not long before his excellent training and rare good sense attracted the favorable notice of Sir William Keith, governor of Pennsylvania. The Philadelphia printers being ignorant and unskillful, Keith wished to secure Franklin's services, and offered to help set him up in business for himself and give him the government printing, such as it was. Franklin had now been seven months in Philadelphia, and, his family having at length heard news of him, it was thought best that he should return to Boston and solicit aid from his father in setting up a press in Philadelphia. On reaching Boston he found his brother sullen and resentful, but his father received him kindly. He refused the desired assistance, on the groined that a boy of eighteen was not fit to manage a business, but he commended his industry and perseverance, and made no objection to his returning to Philadelphia, warning him to restrain his inclination to write lampoons and satires, and holding out hopes of aid in ease he should behave industriously and frugally until twenty-one years of age. On Franklin's return to Philadelphia, the governor promised to furnish the money needful for establishing him in business, and encouraged him to go over to London, in order to buy a press and type and gather useful information. But Sir William was one of those social nuisances that are lavish in promises but scanty in performance. It was with the assurance that the ship's mailbag carried letters of introduction and the necessary letter of credit that young Franklin crossed the ocean. On reaching England, he found that Keith had deceived him. Having neither money nor credit wherewith to accomplish the purpose of his journey or return to America, he sought and soon found a place as journeyman in a London printing house. Before leaving home he had been betrothed to Miss Read. He now wrote to her that it would be long before he should, return to America. His ability and diligence enabled him to earn money quickly, but for a while he was carried away by the fascinations of a great City, and spent his money as fast as he earned it. In the course of his eighteen months in London he gained much knowledge of the world, and became acquainted with some distinguished persons, among others Dr. Mandeville and Sir Hans Sloane; and he speaks of his "extreme desire" to meet Sir Isaac Newton, in which he was not gratified. In the autumn of 1726 he made his way back to Philadelphia, and after some further vicissitudes was at length (in 1729) established in business as a printer. He now became editor and proprietor of the "Pennsylvania Gazette," and soon made it so popular by his ably written articles that it yielded him a comfortable income. During his absence in England, Miss Read, hearing nothing from him after his first letter, had supposed that he had grown tired of her. In her chagrin she married a worthless knave, who treated her cruelly, and soon ran away to the West Indies, where he died. Franklin found her overwhelmed with distress and mortification, for which he felt himself to be partly responsible. Their old affection speedily revived, and on I September 1730, they were married. They lived most happily together until her death, 19 December 1774. As Franklin grew to maturity he became noted for his public spirit and an interest at once wide and keen in human affairs. Soon after his return from England he established a debating society, called the "Junto," for the discussion of questions in morals, politics, and natural philosophy. Among the earliest members may be observed the name of the eminent mathematician, Thomas Godfrey, who soon afterward invented a quadrant similar to Hadley's. For many years Franklin was the life of this club, which in 1743 was developed into the American philosophical society. In 1732 he began publishing an almanac for the diffusion of useful information among the people. Published under the pen name of " Richard Saunders," this entertaining collection of wit and wisdom, couched in quaint and pithy language, had an immense sale, and became famous throughout the world as " Poor Richard's Almanac." In 1731 Franklin founded the Philadelphia library. In 1743 he projected the University that a few years later was developed into the University of Pennsylvania, and was for a long time considered one of the foremost institutions of learning in this country. From early youth Franklin was interested in seientitle studies, and his name by and by became associated with a very useful domestic invention, and also with one of the most remarkable scientific discoveries of the 18th century. In 1742 he invented the "open stove, for the better warming of rooms," an invention that has not yet entirely fallen into disuse. Ten years later, by wonderfully simple experiments with a kite, he showed that lightning is a discharge of electricity; and in 1753 he received the Copley medal from the Royal society for this most brilliant and pregnant discovery. A man so public-spirited as Franklin, and editor of a prominent newspaper besides, could not long remain outside of active political life. In 1736 he was made clerk of the assembly of Pennsylvania, and in 1737 postmaster of Philadelphia. Under his skilful management this town became the center of the whole postal system of the colonies, and in 1753 he was made deputy postmaster general for the continent. Besides vastly increasing the efficiency of the postal service, he succeeded at the same time in making it profitable. In 1754 Franklin becomes a conspicuous figure in Continental politics. In that year the prospect of war with the French led several of the royal governors to call for a congress of all the colonies, to be held at Albany. The primary purpose of the meeting was to make sure of the friendship of the Six Nations, and to organize a general scheme of operations against the French. The secondary purpose was to prepare some plan of confederation that all the colonies might be persuaded to adopt. Only the four New England colonies, with New York, Pennsylvania, and Maryland, sent commissioners to this congress. The people seem to have felt very little interest in the movement. Among the newspapers none seem to have favored it warmly except the "Pennsylvania Gazette," which appeared with a union device and the motto "Unite or Die!" At the Albany congress Franklin brought forward the first coherent scheme ever propounded for securing a permanent Federal union of the thirteen colonies. The plan contemplated the union of the colonies under a single central government, under which each colony might preserve its local independence. The legislative assembly of each colony was to choose, once in three years, representatives to attend a Federal grand council, which was to meet every year at Philadelphia, as the City most convenient of access from north and south alike. This grand council was to choose its own speaker, and could neither be dissolved nor prorogued except by its own consent, or by especial order of the crown. The grand council was to make treaties with the Indians, and regulate trade with them; and it was to have sole power of legislation on all matters concerning the colonies as a whole. To these ends it could lay taxes, enlist soldiers, build forts, and nominate civil officers. Its laws were to be submitted to the king for approval; and the royal veto, in order to be effective, must be exercised within three years. To this grand council each colony was to send a number of representatives, proportioned to its contributions to the continental military service, the minimum number being two, and the maximum seven. With the exception of such matters of general concern as were to be managed by the grand council, each colony was to retain its powers of legislation intact. In an emergency any colony might singly defend itself against foreign attack, and the Federal government was prohibited from impressing soldiers or seamen without the consent of the local legislature. The supreme executive power was to be vested in a president or governor general, appointed and paid by the crown. He was to have a veto on all the acts of the grand council, and was to nominate all military officers, subject to its approval. No money could be issued save by joint order of the governor general and council. "This plan," said Franklin, "is not altogether to my mind; but it is as I could get it." To the credit of its great author, it should be observed that this scheme long afterward known as the "Albany plan "contemplated the formation of a self-sustaining Federal government, and not of a mere league. It aimed at creating "a public authority as obligatory in its sphere as the local governments were in their spheres"; and in this respect it was much more complete than the articles of confederation tinder which the thirteen states contrived to live from 1781 till 1789. But public opinion was not yet ripe for the adoption of such bold and comprehensive ideas. After long debate, the Albany congress decided to adopt Franklin's plan, and copies of it were sent to all the colonies for their consideration; but nowhere did it meet with popular approval. A town meeting in Boston denounced it as subversive of liberty; Pennsylvania rejected it without a word of discussion; not one of the assemblies voted to adopt it. When sent over to England, to be inspected by the ministers of the crown, it only irritated them. In England it was thought to give too much independence of action to the colonies; in America it was thought to give too little. The scheme was, moreover, impracticable, because the desire for union on the part of the several colonies was still extremely feeble; but it shows on the part of Franklin wonderful foresightedness. If the Revolution had not occurred, we should probably have sooner or later come to live under a constitution resembling the Albany plan. On the other hand, if the Albany plan had been put into operation, it insight perhaps have so adjusted the relations of the colonies to the British government that the Revolution would not have occurred. The only persons that favored Franklin's scheme were the royal governors, and this was because they hoped it might be of service in raising money with which to fight the French. In such matters the local assemblies were extremely niggardly. At the beginning of the war in 1755, Franklin had been for some years the leading spirit in the assembly of Pennsylvania, which was engaged in a fierce dispute with the governor concerning the taxation of the proprietary estates. The governor contended that these should be exempt from taxation; the assembly insisted rightly that these estates should bear their one share of the public burdens. On another hotly disputed question the assembly was clearly in the wrong; it insisted upon issuing paper money, and against this pernicious folly governor after governor fought with obstinate bravery. In 1755 the result of these furious contentions was that Braddock's army was unable to get any support except from the steadfast personal exertions of Franklin, who used his great influence with the farmers to obtain horses, wagons, and provisions, pledging his own property for their payment. Until the question of the proprietary estates should be settled, the operations of the war seemed likely to be paralyzed. In 1757 Franklin was sent over to England to plead the cause of the assembly before the Privy Council. This business kept him in England five years, in the course of which he became acquainted with the most eminent people in the country. His discoveries and writings had won him a European reputation. Before He left England, in 1762, he received the degree of LL.D. from the universities of Oxford and Edinburgh. His arguments before the privy council were successful; the sorely vexed question was decided against the proprietary governors; and on his return to Pennsylvania in 1762 he received the formal thanks of the assembly. It was not long before his services were again required in England. In 1764 Grenville gave notice of his proposed stamp act for defraying part of the expenses of the late war, and Franklin was sent to England as agent for Pennsylvania, and instructed to make every effort to prevent the passage of the stamp act. He carried out his instructions ably and faithfully ; but, when the obnoxious law was passed in 1765, he counseled submission. In this case, however, the wisdom of this wisest of Americans proved inferior to the "collective wisdom" of his fellow countrymen. Warned by the fierce resistance of the Americans, the new ministry of Lord Rockingham decided to reconsider the act. 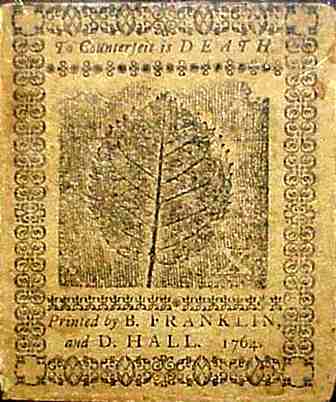 In an examination before the House of Commons, Franklin's strong sense and varied knowledge won general admiration, and contributed powerfully toward the repeal of the stamp act. The danger was warded off but for a time, however, next year Charles Townshend carried, his measures for taxing American imports and applying the proceeds to the maintenance of a civil list in each of the colonies, to be responsible only to the British government. The need for Franklin's services as mediator was now so great that he was kept in England, and presently the colonies of Massachusetts, New Jersey, and Georgia chose him as their agent. During these years he made many warm friendships with eminent men in England, as with Burke, Lord Shetburne, Lord Howe, David Hartley, and Dr. Priestley. His great powers were earnestly devoted to preventing a separation between England and America. His methods were eminently conciliatory; but the independence of character with which he told unwelcome truths made him an object of intense dislike to the king and his friends, who regarded him as aiming to undermine the royal authority in America. George III is said to have warned his ministers against " that crafty American, who is more than a match for you all." In 1774 this dread and dislike found vent in an explosion, the echoes of which have hardly yet died away. This was the celebrated affair of the "Hutchinson letters." For several years a private and unofficial correspondence had been kept up between Hutchinson, Oliver, and other high officials in Massachusetts, on the one hand, and Thomas Whately, who had formerly been private secretary to George Grenville, on the other. The choice of Whately for correspondent was due to the fact that he was supposed to be very familiar at once with colonial affairs and with the views and purposes of the king's friends in these letters Hutchinson had a great deal to say about the weakness of the royal government in Massachusetts, and the need for a strong military force to support it ; he condemned the conduct of Samuel Adams and the other popular leaders as seditious, and enlarged upon the turbulence of the people of Boston; he doubted if it were practicable for a colony removed by 3,000 miles of ocean to enjoy all the liberties of the mother country without severing its connection with her; and he had therefore reluctantly come to the conclusion that Massachusetts must submit to "an abridgment of what are called English liberties." Oliver, in addition to such general views, maintained that judges and other crown officers should have fixed salaries assigned by the crown, so as to become independent of popular favor. There can be no doubt that such suggestions were made in perfect good faith, or that Hutchinson mid Oliver had the true interests of Massachusetts at heart, according to their lamentably inadequate understanding of the matter. But to the people of Massachusetts, at that time, such suggestions could but seem little short of treasonable. Thomas Whately died in June 1772, and all his papers passed into the custody of William, his brother and executor. In the following December before William Whately had opened or looked over the packet of letters from Hutchinson and his friends, it was found that they had been purloined by some person unknown. It is not certain that the letters had ever really passed into William Whately's hands. "They may have been left lying in some place where they might have attracted the notice of some curious busybody, who forthwith laid hands upon them." This point has never been satisfactorily cleared up. At all events, they were brought to Franklin as containing political intelligence that might prove important. At this time Massachusetts was furiously excited over the attempt of Lord North's government to have the salaries of the judges fixed and paid by the crown instead of the colonial assembly. The judges had been threatened with impeachment should they dare to receive a penny from the royal treasury, and at the head of the threatened judges was Oliver's younger brother, the chief justice of Massachusetts. As agent for the colony, Franklin felt it to be his duty to give information of the dangerous contents of the letters now laid before him. Although they purported to be merely a private and confidential correspondence, they were not really " of the nature of private letters between friends." As Franklin said, "they were written by public officers to persons in public station, on public affairs, and intended to procure public measures"; they were therefore handed to other public persons, who might be influenced by them to produce those measures; their tendency was to incense the mother country against her colonies, and, by the steps recommended, to widen the breach, which they effected. The chief caution "from the writers to Thomas Whately" with respect to privacy was, to keep their contents from "the knowledge of the colonial agents in London," who, the writers apprehended, "might return them, or copies of them, to America." Franklin felt, as Willingham might have felt on suddenly discovering, in private and confidential papers, the incontrovertible proof of some popish plot against the life of Queen Elizabeth. From the person that brought him the letters he got permission to send them to Massachusetts, on condition that they should be shown only to a few people in authority, that they should not be copied or printed, that they should presently be returned, and that the name of the person from whom they were obtained should never be disclosed. This last condition was most thoroughly fulfilled. The others must have been felt to be mainly a matter of form; it was obvious that, though they might be literally complied with, their spirit would inevitably be violated. As Orlando Hutchinson writes, " we all know what this sort of secrecy means, and what will be the end of it"; and, as Franklin himself observed, "there was no restraint proposed to talking of them, but only to copying." The letters were sent to the proper person, Thomas Cushing, speaker of the Massachusetts assembly, and he showed them to Hancock, Hawley, and the two Adamses. To these gentlemen it could have been no new discovery that Hutchinson and Oliver held such opinions as were expressed in the letters; but the documents seemed to furnish tangible proof of what had long been suspected, that the governor and his lieutenant were plotting against the liberties of Massachusetts. They were soon talked about at every town meeting and on every Street corner. The assembly twitted Hutchinson with them, and asked for copies of these and other such papers as he might see fit to communicate, He replied, somewhat sarcastically, " If you desire copies with a view to make them public, the originals are more proper for the purpose than any copies." Mistaken and dangerous as Hutchinson's policy was, his conscience acquitted him of any treasonable purpose, and he must naturally have preferred to have the people judge him by what he had really written rather than by vague and distorted rumors. His reply was taken as sufficient warrant for printing the letters, and they were soon in the possession of every reader in England or America who could afford sixpence for a political tract. On the other side of the Atlantic they aroused as much excitement as on this, and William Whitely became concerned to know who could have purloined the letters. On slight evidence he charged a Mr. Temple with the theft, and a duel ensued in which Whately was wounded. Hearing of this affair, Franklin published a card in which he avowed Ins own share in the transaction, and in a measure screened all others by drawing the full torrent of wrath and abuse upon himself. All the ill suppressed spleen of the king's friends was at once discharged upon him. Meanwhile the Massachusetts assembly formally censured the letters, as evidence of a scheme for subverting the constitution of the colony, and petitioned the king to remove Hutchinson and Oliver from office. In January 1774, the petition was duly brought before the Privy Council in the presence of a large and brilliant gathering of spectators. The solicitor general, David Wedderburn, instead of discussing [he question on its merits, broke out with a violent and scurrilous invective against, Franklin, whom he derided as a man of letters, calling him a "man of three letters," the Roman slang expression for fur, a thief. Of the members of government present, Lord North alone preserved decorum ; the others laughed and clapped their hands, while Franklin stood as unmoved as the moon at the baying of dogs. He could afford to disregard the sneers of a man like Wedderburn, whom the king, though fain to use him as a tool, called the greatest knave in the realm. The Massachusetts petition was rejected as scandalous, and next day Franklin was dismissed from his office of postmaster general. They are in error that thinks it was this personal insult that led Franklin to favor the revolt of the colonies, as they are also wrong who suppose that his object in sending home the Hutchinson letters was to stir up dissension. His conduct immediately after passing through this ordeal is sufficient proof of the unabated sincerity of his desire for conciliation. The news of the Boston Tea Party arriving in England about this time, led presently to the acts of April 1774, for closing the port of Boston and remodeling the government of Massachusetts. The only way in which Massachusetts could escape these penalties was by indemnifying the East India company for the tea that had been destroyed; and Franklin, seeing that the attempt to enforce the new acts must almost inevitably lead to war, actually went so far as to advise Massachusetts to pay for the tea,. Samuel Adams, on hearing of this, is said to have observed: " Franklin may be a good philosopher, but he is a bungling politician." Certainly in this instance Franklin showed himself less farsighted than Adams and the people of Massachusetts. The moment had come when compromise was no longer possible. To have yielded now, in the face of the arrogant and tyrannical acts of April would have been not only to stultify the heroic deeds of the patriots in the last December but it would have broken up the nascent union of the colonies; it would virtually have surrendered them, bound hand and foot, to the tender mercies of the king. That Franklin should have suggested such a step, in order to avoid precipitating a conflict, shows forcibly how anxious he was to keep the peace. He remained in England nearly a year longer, though many things were done by the king's party to make his stay unpleasant. During the autumn and winter he had many conversations with persons near the government, who were anxious to find out how the Americans might be conciliated without Eng land's abandoning a single one of the wrong positions that she had taken. This was an insolvable problem, and when Franklin had become convinced of this he reluctantly gave it up and returned to America, arriving in Philadelphia on 5 May 1775, to find that the shedding of blood had just begun. On the next day the assembly of Pennsylvania unanimously elected him delegate to the 2d Continental Congress, then about to assemble. He now became a zealous supporter of the war, and presently of the Declaration of Independence. When congress, in July decided to send one more petition to the king, he wrote a letter, which David Hartley read aloud in the House of Commons. "If you flatter yourselves," said Franklin, "with beating us into submission, you know neither the people nor the country. The congress will await the result of their last petition." A little more than two years afterward, in December 1777, as parliament sat overwhelmed with chagrin at the tidings of Burgoyne's surrender, Hartley pulled out this letter again and up braided the house with it. " You were then," said he, "confident of having America under your feet, and despised every proposition recommending peace and lenient measures." 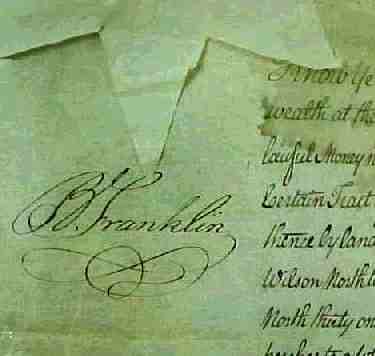 When this unyielding temper had driven the Americans to declare their independence of Great Britain, Franklin was one of the committee of five chosen by congress to draw up a document worthy of the Occasion. To the document, as drafted by Jefferson, he seems to have contributed only a few verbal recommendations. The Declaration of Independence made it necessary to seek foreign alliances, and first of all with England's great rival, France. Here Franklin's worldwide fame and his long experience of public life in England enabled him to play a part that would have been impossible for any other American. He had fifteen years of practice as an ambassador, and was thoroughly familiar with European polities. In his old days of editorial work in Philadelphia, with his noble scholarly habit of putting every moment to some good use, he had learned the French language, with Italian and Spanish also, besides getting some knowledge of Latin. He was thus possessed of talismans for opening many a treasure house, and among all the on eyelopaedist philosophers of Paris it would have been hard to point to a mind more encyclopedic than his own. Negotiations with the French court had been begun already, through the agency of Arthur Lee and Silas Deane, and in the autumn of 1776 Franklin was sent out to join with these gentlemen in securing the active aid and cooperation of France in the war. His arrival, on 21 December was the occasion of great excitement in the fashionable world of Paris. Thinkers like D'Alembert and Diderot regarded him as the embodiment of practical wisdom. To many he seemed to sum up in himself the excellences of the American cause, justice, good sense, and moderation. It was Turgot that said of him, " Eripuit coelo fuhnen, sceptrumque tyrannis." As symbolizing the liberty for which all France was yearning, he was greeted with a popular enthusiasm such as perhaps no French man of letters except Voltaire has ever called forth. Shopkeepers rushed to their doors to catch a glimpse of him as he passed along the sidewalk, while in evening salons jeweled ladies of the court, vied with one another in paying him homage. As the first fruits of his negotiations, the French government agreed to furnish two million livres a year, in quarterly installments, to aid the American cause. Arms and ammunition were sent over, and Americans were allowed to fit out privateers in French ports, and even to bring in and sell their prizes. Further than this France was not yet ready to go. She did not wish to incur the risk of war with England until an American alliance could seem to promise her some manifest advantage. This surreptitious aid continued through the year 1777, until the surrender of Burgoyne put a new face upon things. The immediate consequence of that great event was an attempt on the part of Lord North's government to change front, and offer concessions to the Americans, which, if they had ever been duly considered, might even at this late moment have ended in some compromise between England and the United States. Now, if ever, was the moment for France to interpose, and she seized it. On 6 February 1778, the treaty was signed at Paris, which ultimately secured the independence of the United States. For the successful management of this negotiation, one of the most important in the annals of modern diplomacy, the credit is almost solely due to Franklin. Another invaluable service was the negotiation of loans without which it would have been impossible for the United States to carry on the war. As the Continental congress had no power to levy taxes, there were but three ways in which it could pay the expenses of the army: (1) By requisitions upon the state governments; (2) by issuing its promissory notes, or so-called "paper money"; (3) by foreign loans. The first method brought in money altogether too slowly; the second served its purpose for a short time, but by 1780 the continental notes had became worthless. The war of independence would have been an ignominious failure but for foreign loans, and these were made mostly by France and through the extraordinary sagacity and tact of Franklin. It is doubtful if any other man of that time could have succeeded in getting so much money from the French government, which found it no easy matter to pay its own debts and support an idle population of nobles and clergy upon taxes wrung from a groaning peasantry. During Franklin's stay in Paris the annual contribution of 2,000,000 livres was at first increased to 3,000,000, and afterward, in 1781, to 4,000,000. Besides this, which was a loan, the French government sent over 9,000,000 as a free gift, and guaranteed the interest upon a loan of 10,000,000 to be raised in Holland. Franklin himself, just before sailing for France, had gathered together all the cash he could command for the moment, beyond what was needed for immediate necessities, and amounting to nearly £4,000, and put it into the United States treasury as a loan. On the fall of Lord North's ministry in March 1782, Franklin sent a letter to his friend, Lord Shelburne, expressing a hope that peace might soon be made. When the letter reached London, the new ministry, in which Shelburne was secretary of state for home and colonies, had already been formed, and Shelburne, with the consent of the cabinet, replied by sending over to Paris an agent to talk with Franklin informally, and ascertain the terms upon which the Americans would make peace. The person chosen for this purpose was Richard Oswald, a Scottish merchant of frank disposition and liberal views. In April there were several conversations between Oswald and Franklin, in one of which the latter suggested that, in order to make a durable peace, it was desirable to remove all occasion for future quarrel; that the line of frontier between New York and Canada was inhabited by a lawless set of men, who in time of peace would be likely to breed trouble between their respective governments; and that therefore it would be well for England to cede Canada to the United States. A similar reasoning would apply to Nova Scotia. By ceding these countries to the United States, it would be possible, from the sale of unappropriated lands, to indemnify the Americans for all losses of private property during the war, and also to make reparation to the Tories whose estates had been confiscated. By pursuing such a policy, England, which had made war on America unjustly, and had wantonly done it great injuries, would achieve not merely peace, but reconciliation with America, and reconciliation, said Franklin, is "a sweet word." This was a very bold tone for Franklin to take: but he knew that almost every member of the Whig ministry had publicly expressed the opinion that the war against America was unjust and wanton; and being, moreover, a shrewd hand at a bargain, he began by setting his terms high. Oswald seems to have been convinced by Franklin's reasoning, and expressed neither surprise nor reluctance at the idea of ceding Canada. The main points of this conversation were noted upon a sheet of paper, which Franklin allowed Oswald to take to London and show to Lord Shelburne, first writing upon it an express declaration of its informal character. On receiving this memorandum, Shelburne did not show it to the cabinet, but returned it to Franklin without any immediate answer, after keeping it only one night. Oswald was presently sent back to Paris, empowered as commissioner to negotiate with Franklin, and carried Shelburne's answer to the memorandum that desired the cession of Canada for three reasons. The answer was terse: "1. By way of reparation. Answer: No reparation can be heard of. 2. To prevent future wars. Answer: it is to be hoped that some more friendly method will be found. 3. As a fund of indemnification to loyalists. Answer : No independence to be acknowledged without their being taken care of." Besides, added Shelburne, the Americans would be expected to make some compensation for the surrender of Charleston, Savannah, and the City of New York, still held by British troops. From this it appears that Shelburne, as well as Franklin, knew how to begin by asking more than he was likely to get. England was no more likely to listen to a proposal for ceding Canada than the Americans were to listen to the suggestion of compensating the British for surrendering New York. But there can be little doubt that the bold stand thus taken by Franklin at the outset, together with the influence he acquired over Oswald, contributed materially to the brilliant success of the American negotiations. This is the more important to be noted in connection with the biography of Franklin, since in the later stages of the negotiations the initiative passed almost entirely out of his hands, and into those of his colleagues, Jay and Adams. The form that the treaty took was mainly the work of these younger statesmen; the services of Franklin were chiefly valuable at the beginning, and again, to some extent, at the end. There were two grave difficulties in making a treaty. The first was, that France was really hostile to the American claims. She wished to see the country between the Alleghenies and the Mississippi divided between England and Spain; England to have the region north of the Ohio, and the region south of it to remain an Indian territory under the protectorate of Spain, except a narrow strip on the western slope of the Alleghenies, over which the United States might exercise protectorship. In other words, France wished to confine the United States to the east of the Alleghenies, and forever prevent their expansion westward. France also wished to exclude the Americans from all share in the fisheries, in order to prevent the United States from becoming a great naval power. As France, up to a certain point, was our ally, this antagonism of interests made the negotiation extremely difficult. The second difficulty was the unwillingness of the British government to acknowledge the independence of the United States as a condition that must precede all negotiation. The Americans insisted upon this point, as they had insisted ever since the Staten Island conference in 1776; but England wished to withhold the recognition long enough to bargain with it in making the treaty. This difficulty was enhanced by the fact that, if this point were conceded to the Americans, it would transfer the conduct of the treaty from the colonial secretary, Shelburne, to the foreign secretary, Fox; and these two gentlemen not only differed widely in their views of the situation, but were personally bitter enemies. Presently Fox heard of the private memorandum that Shelburne had received from Franklin but had not shown to the cabinet, and he concluded, quite wrongly, that Shelburne was playing a secret part for purposes of his own. Accordingly, Fox made up his mind at all events to get the American negotiations transferred to his own department; and to this end, on the last day of June he moved in the cabinet that the independence of the United States should be unconditionally acknowledged, so that England might treat as with a foreign power. The motion was lost, and Fox prepared to resign his office; but the very next day the death of Lord Rockingham broke up the ministry. Lord Shelburne now became prime minister, and other circumstances occurred which simplified the problem, in April the French fleet in the West Indies had been annihilated by Rodney; in September this was followed by the total defeat of the combined French and Spanish forces at Gibraltar. This altered the situation seriously. England, though defeated in America, was victorious as regarded France and Spain. The avowed object, for which France had entered into alliance with the Americans, was to secure the independence of the United States, and this point was now substantially gained. The chief object for which Spain had entered into alliance with France was to drive the English from Gibraltar, and this point was now decidedly lost. France had bound herself not to desist from the war until Spain should recover Gibraltar; but now there was little hope of accomplishing this, except by some fortunate bargain in the treaty. Vergennes now tried to satisfy Spain at the expense, of the United States, and he sent a secret emissary under an assumed name to Lord Shelburne, to develop his plan for dividing the Mississippi valley between England and Spain. This was discovered by Jay, who counteracted it by sending a messenger of his own to Shelburn who thus perceived the antagonism that had arisen between the allies. It now became manifestly for the advantage of England and the United States to carry on their negotiations without the intervention of France, as England preferred to make concessions to the Americans rather than to the house of Bourbon. By first detaching the United States from the alliance, she could proceed to browbeat France and Spain. There was an obstacle in the way of a separate negotiation. The chevalier Luzerne, the French minister at Philadelphia, had been busy with congress, and that body had sent instructions to its commissioners at Paris to be guided in all things by the wishes of the French court. Jay and Adams, overruling Franklin, took the responsibility of disregarding these instructions; and the provisions of the treaty, so marvelously favorable to the Americans, were arranged by a separate negotiation with England. In the arrangement of the provisions, Franklin played an important part, especially in driving the British commissioners from their position with regard to the compensation of loyalists. After a long struggle upon this point, Franklin observed that, if the loyalists were to be indemnified, it would be necessary also to reckon up the damage they had done in burning villages and shipping, and then strike a balance between the two accounts" and he gravely suggested that a special commission might be appointed for this purpose. It was now getting late in the autumn, and Shelburne felt it to be a political necessity to bring the negotiation to an end before the assembling of parliament. At the prospect of endless discussion, which Franklin's suggestion involved, the British commissioners gave way and accepted the American terms. Affairs having reached this point, it remained for Franklin to lay the matter before Vergennes in such wise as to avoid a rupture of the cordial relations between America and France. It was a delicate matter, for, in dealing separately with the English government, the Americans laid them open to the charge of having committed a breach of diplomatic courtesy; but Franklin managed it with entire success. On the part of the Americans the treaty of 1783 was one of the most brilliant triumphs in the whole history of modern diplomacy. Had the affair been managed by men of ordinary ability, the greatest results of the Revolutionary war would probably have been lost; the new republic would have been cooped up between the Atlantic and the Alleghenies; our westward expansion would have been impossible without further warfare; and the formation of our Federal union would doubtless have been effectively hindered or prevented. To the grand triumph the varied talents of Franklin, Adams, and Jay alike contributed. To the latter is due the credit of detecting and baffling the sinister designs of France; but without the tact of Franklin this probably could not have been accomplished without offending France in such wise as to spoil everything. Franklin's last diplomatic achievement was the negotiation of a treaty with Prussia, in which was inserted an article looking toward the abolition of privateering. This treaty, as Washington observed at the time, was the most liberal that had ever been made between independent powers, and marked a new era in international morality. In September 1785, Franklin returned to America, and in the next month was chosen president of Pennsylvania. He was reelected in 1786 and 1787. In the summer of the latter year he was a delegate to the immortal convention that framed the Constitution of the United States. He took a comparatively small part in the debates, but some of his suggestions were very timely, as when he seconded the Connecticut compromise. At the close of the proceedings he made a short speech, in which he said: "I consent, to this constitution, because I expect no better, and because I am not sure that it is not the best." Donaldson’s Crossroads Land Grant dated May 23, 1787 “ … a certain tract of land called ‘Donaldson’ situate on the waters of Peters Creek in Washington County … unto John Mc Daniel and his heirs …” signed "B. Franklin." Start your search on Benjamin Franklin.